make your John Deere get up and go. With cabs for all the major brands, Cozy means quality, comfort and productivity. Easy installation makes Cozy Cab the brand to trust. A day in the sun is…often just too much. Our sunshades are light weight plastic with steel mounting hardware that clamps to your roll bar without drilling. Bimini sunshades feature acrylic coated polyester on a durable aluminum frame. Find most anything you need for your ROPS here. Radio speakers, cooling fans and lights can all make your time more comfortable and enjoyable. 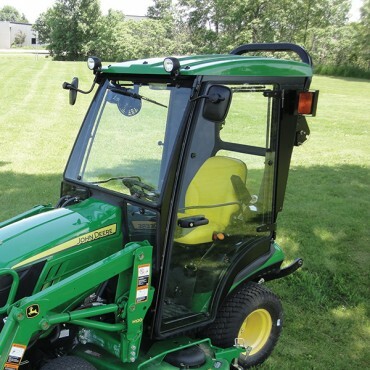 Our John Deere-specific cabs, sunshades and accessories provide all-weather protection, are easy to install, and look great. So comfortable, you’ll never want to quit. 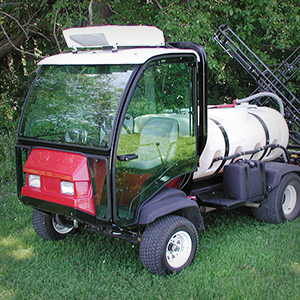 You already have the best turf sprayer and mowers on the market, now make them more comfortable with a cab or sunshade built specifically for them. Don't stop there, we also have optional accessories to help you work efficiently and get more done. Whether you’re running Kioti or McCormick compact tractors, our EZ Cabs and cab accessories provide comfort, weather protection and easy installation (2 hours or less!) Do more work, more comfortably. Cozy Cabs are built to protect you from nature’s elements and hazards while making your time more productive and enjoyable. 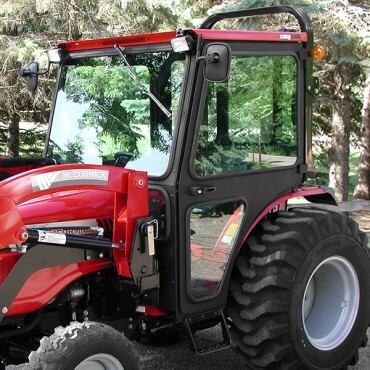 We specialize in compact tractor cabs/enclosures, and sunshades for brands like John Deere, Toro, Kioti, and McCormick. We also offer accessories such as sunshades, heater kits, wiper kits, light kits, and mirrors. The strategy’s worked for us since 1962. Now put it to work for you.